By Nicholas Cunningham - posted Friday, 1 February 2019 Sign Up for free e-mail updates! "Despite greater oil price volatility in recent months, our research shows that the sector appears confident in its ability to better cope with market instability and long-term lower oil and gas prices," said Liv Hovem, the head of DNV's oil and gas division, according to Reuters. "For the most part, industry leaders now appear to be positive that growth can be achieved after several difficult years." A report from Muktadir Ur Rahman of Apex Consulting finds that the cost of development for the seven largest oil companies – BP, Shell, Eni, Chevron, ExxonMobil, Total and ConocoPhillips – are set to rise. Apex's "Supermajors Cost Index" measures the costs of the oil majors, which is not only useful to understand costs for those specific companies, but also because it offers a proxy for industry-wide trends. At the other end of the spectrum is ExxonMobil. 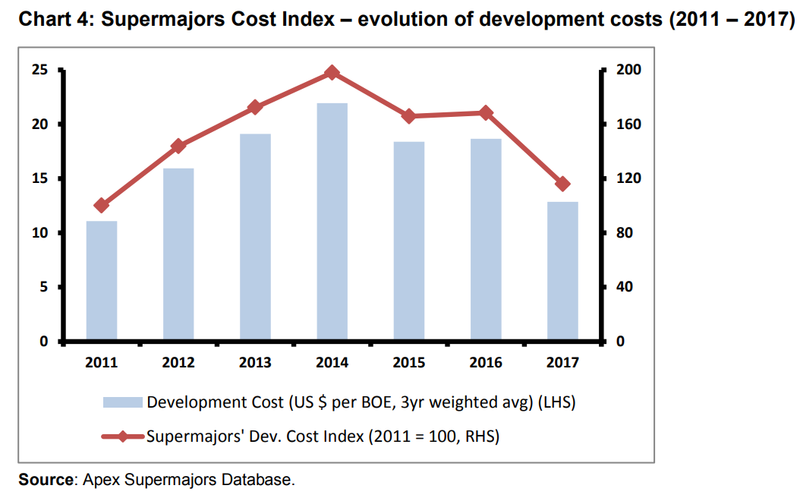 "ExxonMobil went from having one of the lowest development costs per BOE in 2011 to having the highest amongst the supermajors in 2017," Muktadir Ur Rahman wrote in the Apex report. A big reason for this was Exxon's decision to downgrade its oil reserves in 2016.